I’ll get around to filling in the past days of the trip later. Right now, I’ll use the handy dandy iPhone app for WordPress to post as we go. As long as we have cell service, I can get at least short posts and some unedited pictures up. 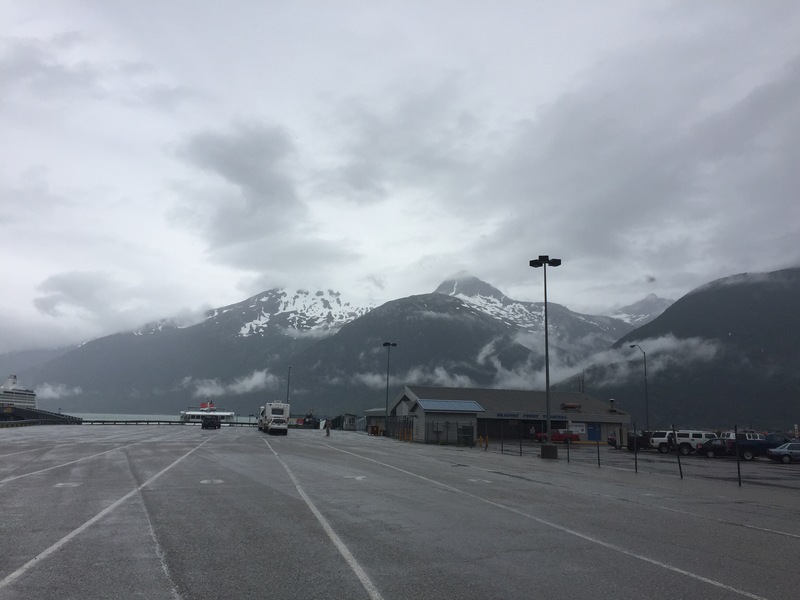 We came back to Skagway yesterday (Saturday, July 8) from Juneau. We spent a week in Juneau visiting my 2nd sister. Owen flew home from there, while Larry and I continue our trip. Today we are ferrying to Haines. This is the view from the ferry dock in Skagway. Yes, that’s snow on the mountains, although it is hard to see it through the clouds. It is 54 degrees and raining at the dock. This is fairly typical weather for this section of Alaska in the summer – the world’s largest temperate rainforest is along this coastline.